Learn how to access FreeRange TV on your computer or laptop. Shaw Direct FreeRange TV allows you to enjoy your favourite TV shows and movies directly on your computer. Use of the new FreeRange.Shaw.ca website will count towards your FreeRange TV device and simultaneous stream limits. 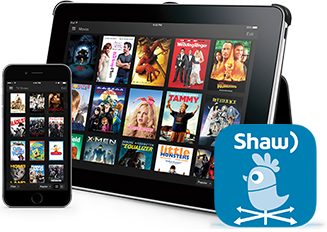 FreeRange TV is available to Shaw Direct TV customers for no additional cost and can be accessed either through your mobile device with the Shaw FreeRange TV app, or through your computer on supported systems. To access FreeRange TV on your desktop or laptop computer, navigate to FreeRange.Shaw.ca (or FreeRangeTV.Shaw.ca). The service will use the same sign in process you are familiar with today where you can use your Shaw Direct credentials. Once signed in, you will be prompted to give your device a name. This allows you to easily recognize and manage the device in the future through My Shaw Direct. As the site uses the same login credentials, FreeRange TV activity will be tied across all devices, so you could start watching a title on the app and continue watching on the web version (or vice versa). If you do not meet the minimum requirements listed above, you will be presented with an error message indicating you are below the requirements for accessing FreeRange TV on the web. FreeRangeTV.Shaw.ca is only accessible through Mac and Windows computers. If you would like you to view this content through your smart device (smartphone or tablet) you can download the Shaw FreeRange TV app here: FreeRange TV - App. Layout is intended for a monitor with more real-estate to display content compared to the app version. Picture in picture browsing allows you to watch programming while you browse the guide. Rotten Tomatoes scores will directly link to the site in a separate tab. There is currently no download-to-go functionality for the web version of FreeRange TV. SD/HD (up to 720p) playback quality options are available. Note: Download-to-go functionality is only available through the FreeRange TV app. For more information on this feature as well as links to download the app on your smart device, visit the Shaw Support Community page. When accessing Shaw Direct FreeRange TV on your computer, you can use the following keyboard player shortcuts to navigate FreeRange TV content quickly and easily. These player controls include the ability to play/pause content, skip forward and back, adjust the volume, toggle between full-screen and minimized modes, and more. To check out the full list of player controls and display all the shortcuts, press "?" on your keyboard while visiting FreeRange.Shaw.ca. Note: Fast-forward not available on all titles.